Progress for schools working with Charlotte Knox and/or Dennis Parker for one or more years for 4–12 days per year. Strategic Schooling is a model for achieving optimal human and organizational performance by working smarter rather than harder. The model includes four domains: targets, feedback, know-how, and context. 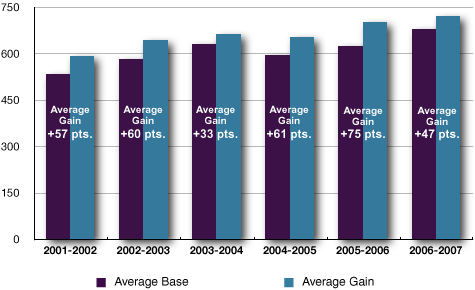 On average, schools working with Knox Education make a gain of 57 points on Academic Performance Index. This progress is based on schools working with Charlotte Knox and/or Dennis Parker for one or more years at 4–12 days per year.